Synesthesia is a neurological condition in which two or more bodily senses are merged so that the detection of each is mismatched. In this paper I will investigate the history of this condition, the primary researchers, the neurological factors, whether it is perceptual or cognitive and how it relates to metaphors and the consciousness debate in philosophy. Synesthesia. Jensen, Amber . Lethbridge Undergraduate Research Journal. Volume 2 Number 1. 2007. In the first neuroscience class that I took, I learned that the human brain has three primary functions: to create a sensory reality, to integrate information and to produce behavior (Kolb & Whishaw, 2005). We live our lives assuming that our sensory realities are somewhat universal and that when one person hears a flute playing a song that the next person has the same general experience. What if we found a small group of people for whom sensory experiences are mingled and interchanged and didn't resemble what we experience at all? When they hear the flute playing they see a specific shape in a specific color. Well this seemingly alien situation does exist, the group of people are called synesthetes and their condition is called synesthesia. Synesthetic images are spatially extended, meaning they often have a definite 'location'. There are various types of synesthesia that one can have. From 175 case histories (finding synesthetic subjects is difficult which leads to small sample sizes), researcher Sean Day has identified 19 different types. They range from the most common, grapheme-color, and sound-color to the least common (which there are five of and only one case of each) sound-odor, temperature-color, taste-touch, touch-smell, and vision-touch. Other reported cases include colored pain, colored sexual orgasms and colored personalities. While nearly every possible combination of experiences is logically possible, not all have been identified. Synesthetes are very particular about their associations. A ‘J' is not just orange but the dull orange of an old cat's fur, for example. They also seem to get irritated if they see a grapheme in the ‘wrong' color. Synesthesia is almost always idiopathic but can also be acquired with the ingestion of hallucinogenic drugs such as LSD and mescaline, and also has been found to be very common in patients with temporal lobe epilepsy. These alternative ways of acquiring the condition offer new insights and paths for future research. If synesthesia can be triggered using drugs then are there latent connections in our brains or do only people with a predisposition get the experience? This is something that has not been studied due to the ethical factors in using illegal drugs for experiments. Prevalence estimations have varied from 1 in 25,000 (Cytowic, 1989) to 1 in 20 (Galton, 1880) but the most widely cited statistic comes from Baron-Cohen et. al. (1996) which is 1 in 2000. Ramachandran and Hubbard have recently claimed that this is an underestimate and their informal samples have suggested a number closer to 1 in 200. The gender ratio has been determined to be 6:1 with females being more likely to have synesthesia (Baron-Cohen et. al., 1996). The large difference in the prevalence rates may be attributed to the fact that many synesthetes live “in the closet” for lack of a better term. They may have revealed their condition when they were young but may have been told that they were just using their imagination or being silly so they decided to keep in to themselves. Another account for the differences could be the lack of consistent criteria for diagnosing synesthesia. The earliest notations of synesthesia were made by Sir Frances Galton (who happened to be Charles Darwin's cousin) in the 19th century. He was also the first to suppose that this condition ran in families (this has since been proven to be true). Synesthesia was first acknowledged at the turn of the century when famous people such as Vladimir Nabokov and Duke Ellington and showed signs of the condition. The oldest study that I found regarding synesthesia besides Galton's work was done in 1942 and was followed by little else until the past two decades when research has intensified as we learn more about the brain. This first early report (Karwoski et. al., 1942) focused on the fourth most common (Day, 1999) type of synesthesia that involves colors being evoked from sounds. It detailed a variety of tests the researchers did to their subjects and the results were in the form of traditional psychological principles rather than any causal factors or neurological basis for the phenomenon. In the early 1990's there was a ‘synesthesia renaissance' which has been said to have started with Richard Cytowic's book The Man Who Tasted Shapes and this is when some ground-breaking research was revealed by some of the key professionals in the field. Because synesthesia is such a rare condition, there have been only a handful of researchers that are on the forefront of the current studies. The most prominent would be neurologist Vilayaneur S. Ramachandran MD, PhD. who is the director of the Center for Brain and Cognition at the University of California. He has published many papers on perception, color and motion, and phantom limb syndrome before settling in on synesthesia in the late 1990's. His popular article entitled, “Hearing colors, tasting shapes.” was originally published in Scientific American (2003), later reprinted in Scientific American Mind (2005) and also just recently reprinted in a special edition of Scientific American Mind called “Secrets of the Senses” (2006) and has brought this mysterious condition to light in a pop-culture type way for the general public. Also notable are Richard E. Cytowic, M.D. and Simon Baron-Cohen, PhD. both of whom are considered pioneers and experts in the field. Is Synesthesia Perceptual or Cognitive? Ramachandran and Hubbard devised some clever experiments to determine the answer to this question. Their tests included pop out displays using 2's and 5's (shown below), showing a grapheme in the subject's periphery and testing whether Roman numerals and other, similar symbols elicited the same response as the basic grapheme. The image on the right is what non-synesthetes see and the image on the left is what they synesthetes see. Even though it is slightly difficult to decipher the 2's and 5's for us, the corresponding colors are seen immediately for the synesthetes. It was thus determined that synesthesia is a perceptual effect (Ramachandran and Hubbard, 2001) because of the results of these experiments now the next step is to determine how and why it happens. The neurological way synesthetes experience their condition has been defined in recent studies thanks to the technology of PET scans, MRI's and fMRI's. The action has been determined to take place in the left side of the brain in the numbered visual cortex areas. In this area we have areas V1, V2, V3, V4 and V5, each being responsible for a specific part of visual functioning such as motion, direction, color and perception. The consensus seems to be that in a grapheme-color synesthetic subject, area V4 is activated while areas V1 and V2 show no activity. It was previously thought that there could be no visual experience without activity in V1. This indicates that there is some cross-activation in these areas, much like what happens with the hand and face areas of phantom-limb patients. It is no coincidence that V4 is adjacent to V1 and V2 and that grapheme-color synesthesia is the most common type. Another startling finding is that when synesthetes actually view colors, their left V4 does not activate in the usual manner in color visual stimulation. Although controversial, the “neonatal hypothesis” is generally accepted as a causal explanation of synesthesia and states that we are all born with the neurological workings of synesthetes but for most of us, the mismatched connections were destroyed during the pruning process that occurs during infanthood. It has been suggested that a singe gene mutation in the X chromosome causes this lack of pruning (Ramachandran & Hubbard, 2005) because the condition is genetic and tends to be passed down through the mother. This discovery is only a theory of how the potential for synesthesia is made. One may be born with the phenotype for less synaptic pruning but one is not born with certain word, smell, color or taste associations, these are learned in childhood. It remains a mystery why certain numbers, for example, are certain colors to synesthetes and while some have suggested that things such as colored fridge magnets or colored letter blocks influence the associations, this speculation has been disproved because it cannot explain other associations such as those that involve taste or hearing for example. So why did this gene survive? We all know that through evolution, genes that have no use eventually die out so why has the synesthesia gene remained? There is no apparent direct benefit to having this gene so we can infer that there must be an attached trait like the sickle-cell anemia situation. The most obvious would be that a larger proportion of synesthetes are artists and writers than non-synesthetes suggesting that they have a higher propensity for understanding metaphor which is a key to knowledge and knowledge is a key to survival. Upon first reading the color-grapheme associations that are most common such as ‘O' being white and ‘T' being blue, my initial thought were empathetic, I could ‘see' or understand that an ‘O' seemed to be white and a ‘T' seemed blue so is there a bit of synesthesia in everyone? This is probably not the case. Most of us have the ability to comprehend metaphors and the location in the brain that has been associated with this ability is the angular gyrus. A popular experiment to demonstrate this is the “Booba/ Kiki Effect”. 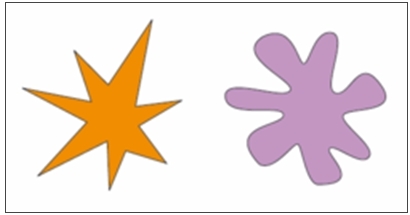 In this experiment, originally designed by Gestalt psychologist Wolfgang Kohler, two shapes (shown below) are shown to subjects. They are asked which one is a ‘booba' and which one is a ‘kiki'. An overwhelming 98% of subjects chose the curvy figure as a ‘booba' and the pointed figure as a ‘kiki'. By understanding how this effect works, we can think of this type of cross-activation (sound and shape) as similar to how synesthetes' perceptual maps are cross-activated. The amount of progress that has been made with synesthesia research in the past twenty years is amazing. The future is ripe with possibilities for more discoveries. One of the limitations of studies so far has been the lack of a large subject-base but the revelation of some more recent famous people having synesthesia such as scientists Nikola Tesla and Richard Feynman (grapheme-color type) and the acceptance of this condition by science, we can hope that more people will come forward with this curious condition and we can have greater subject groups available for research. Fourth year psychology student at the University of Lethbridge with interests in consciousness, metaphysics and philosophy of mind. This paper was done as an independent study under Dr. Robbin Gibb (NEUR 3990) and I wish to thank her for her support with this project. I also wish to thank Dr. Bryson Brown, Chair of the Philosophy Department here at the University of Lethbridge for his contributions to the paper. Chalmers, D. (1997), The Conscious Mind: In Search of a Fundamental Theory. Oxford: Oxford University Press. Cytowic, R. E. (2002). Touching tastes, seeing smells- and shaking up brain science. Cerebrum. Dann, K. T. (1998), Bright Colors Falsely Seen: Synaesthesia and the Search for Transcendent Knowledge. New Haven: Yale University Press. Dawkins, R. (1976), The selfish gene. Oxford: Oxford University Press. Dixon, M.J.et al. (2000). Five plus two equals yellow. Nature, July 27. Dixon, M.J. et. al. (2004). Not all synaesthetes are created equal: projector versus associator synaesthete. Cognitive, Affective, & Behavioral Neuroscience, 4 (3). Duffy, P. L. (2001). Blue cats and chartreuse kittens: how synesthetes color their world. New York: Henry Holt. Galton, F. (1881), Visualized numerals, Journal of the Anthropological Institute, Vol. 10, pp. 85-102. Goode, E. (1999, February 23). When people see a sound and hear a color. New York Times. Hornik, S. (2001, February). For some, pain is orange. Smithsonian Magazine. Hubbard, E. M. et al. (2005) Individual differences among grapheme-color synesthetes: brain-behavior correlations. Neuron, (45)(6), pp975-985. Karwoski, T. F., Odbert, H. S., & Osgood, C. E. (1942). Studies in synaesthetic thinking: II. The role of form in visual responses to music. Journal of General Psychology, vol. 26, 199-222. Lemley, B. (1999, December). Do you see what they see? Discover Magazine. Mass, W. (2003). A mango-shaped space. New York: Little, Brown and Co.
Ramachandran, V. S. (2004). A brief tour of human consciousness; Pi Press. Ramachandran, V. S. & Hubbard, E. M. (2005). Hearing colors, tasting shapes. Scientific American Mind, pp. 17-23. Ramachandran , V.S. & Hubbard, E.M (2005, November 3) Neurocognitive mechanisms in synesthesia. Neuron, (48). Ramachandran , V.S., & Hubbard, E.M. (2001) Psychophysical investigations into the neural basis of synaesthesia. Proceedings of the Royal Society of London, B, Vol. 268, pp979-983. Ramachandran, V. S. & Hubbard, E. M. (2001) Synaesthesia: a window into perception, thought and language, Journal of Consciousness Studies, (8)(12), pp. 3-34. Robertson, L. C. and Sagiv, N. (Eds., 2005) Synesthesia- Perspectives from cognitive neuroscience. Oxford: Oxford University Press. Sagiv, N., Heer, J. & Robertson, L.C. (2006), Does binding of synesthetic color to the evoking grapheme require attention?, Cortex, vol. 42, no. 2, pp. 232-242.